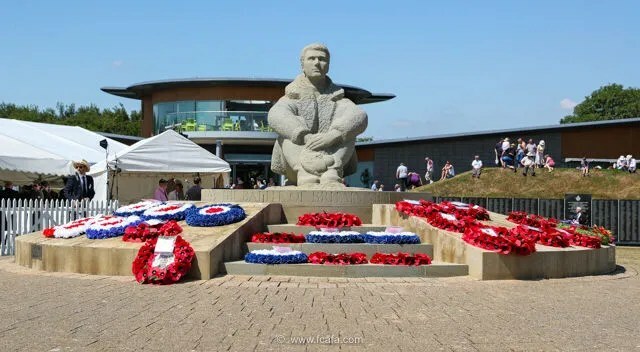 The 77th Anniversary to commemorate the Battle of Britain was held on 9 July 2017 at the National Battle of Britain Memorial, at Capel-le-Ferne, Kent. The ceremony commenced at 13:15 with the Central Band of the RAF leading into the parade area. 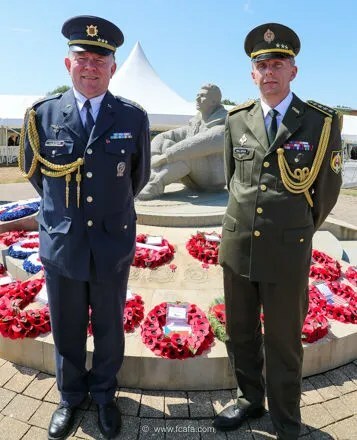 over 60 Association Standards were carried by representatives of the veteran ex-Service Associations in the South East, the Kent Wing Air Training Corps, and also the Polish Air Force replica standard. A Colour Party from the Queen’s Colour Squadron of the RAF Regiment, escorted the RAF Silk Ensign was presented to Guest of Honour Air Chief Marshall Sir Steven Hillier, who took the Royal Salute, at 13:30. This was followed by Battle of Britain Memorial Flight’s Hurricane leading a Spitfire for a flypast over the Pilots Memorial. An inspection of the assembled Standard bearers and ATC cadets was then undertaken Air Chief Marshall Sir Steven Hillier. On returning from their inspection, Air Chief Marshall Sir Steven Hillier gave a speech welcoming all to the ceremony. The exceptional heat was taking it toll on the Standard bearers and ATC cadets with several being relieved from their posts for medical attention. As a consequence the ATC cadets were instructed to sit down and a shortened Service of Commemoration was held. 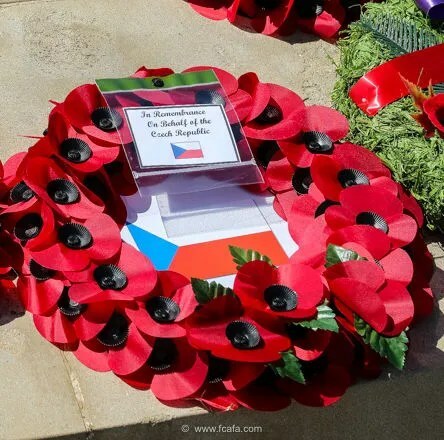 Wreaths were then layed at the Pilots Memorial by Viscount De L’Isle,Air Chief Marshall Sir Steven Hillier, local dignitaries, representatives of numerous RAF Associations, the Polish Airmen’s Association and the Polish Airmen’s Memorial Committee, Capel-le-Ferne primary school and Defence Attache’s representing Australia, Canada, Czech Republic, New Zealand, Poland, Slovak Republic and the United States. 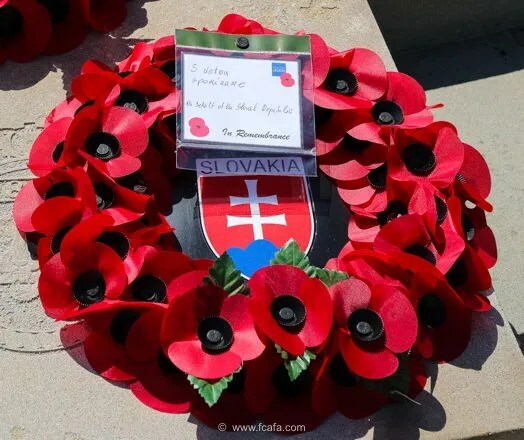 The eighty-eight Czechoslovak Battle of Britain pilots were remembered by their homeland with wreaths being laid by Col. Jiří Svatos, Czech Defence Attachée, and Col. Milan Gavlas, Slovak Defence Attaché, on behalf of their respective London Embassies. Col. Col. Jiří Svatos and Col. Milan Gavlas. 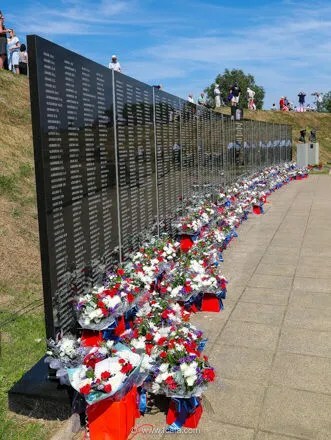 Relatives of ‘The Few’ then went to the Christopher-Noxley Memorial Wall where they laid their red, white and blue flower tributes by the Memorial Wall. 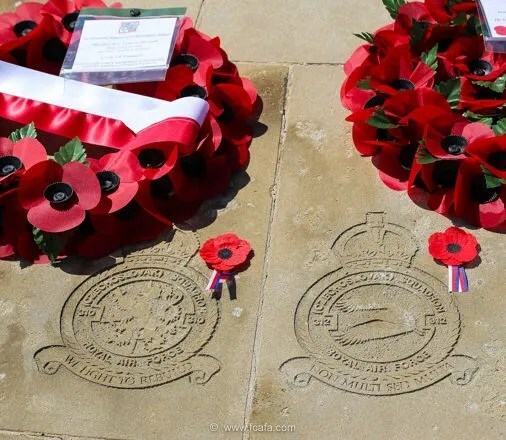 The Ceremony concluded at 15:00 with the return of the Spitfire and Hurricane for a enthralling flying display. 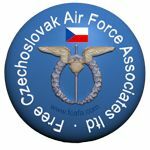 Why not sponsor a Czechoslovak Battle of Britain pilot? 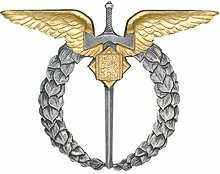 This entry was posted in 310 Sqd, 312 Sqd, Anniversary, Battle of Britain, Ceremony, Not Forgotton. Bookmark the permalink. Thank you for going there! They are not forgotten.